Hi Friends!! 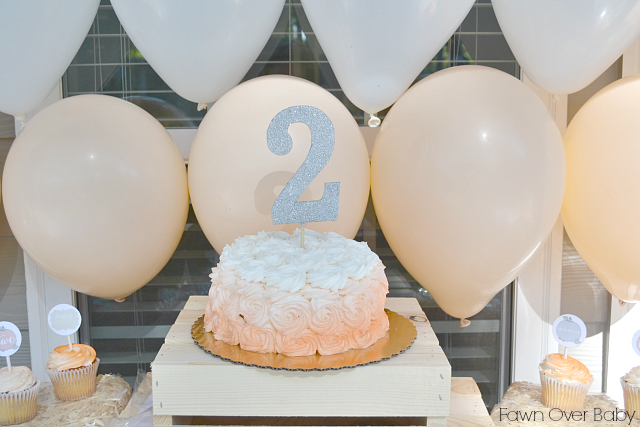 Well, it's been several weeks now since our little bundle of joy turned two! I thought by year two, it would seem as though two years have actually passed. 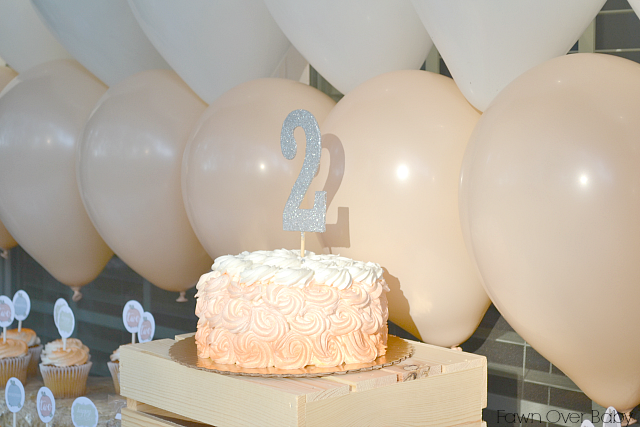 I was sadly mistaken, McKenzie's second birthday was just as bitter sweet as her first. 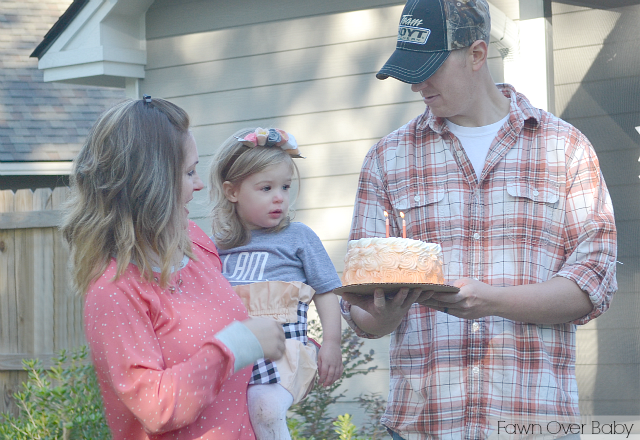 Its so hard to believe that we have two years of parenthood under our belts, when it seems like just yesterday we brought her home from the hospital?! Though she has grown and developed so much, I still see her as my little newborn, my little baby. I couldn't be more proud of her, she has adjusted so well to all the changes that have taken place the past couple of years. We survived the long drive from Anchorage, Alaska to Georgia and we both adjusted wonderfully to my new part-time job working down the hall from her part-time pre-school class (yes, I'm connected to her hip as much as she is mine- sad but true). All in all, she is now a true toddler in every sense of the word. With the good, the bad and the no-so-pretty moments - we fall in love with her more and more with each new day. We are truly so blessed and so happy that God gave us such a precious gift. 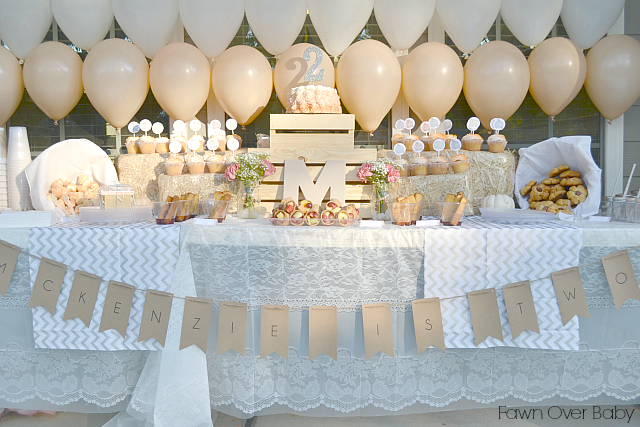 Since I was unable to organize a big birthday bash for Kenzie's First Birthday last year, I decided to make up for it this year. 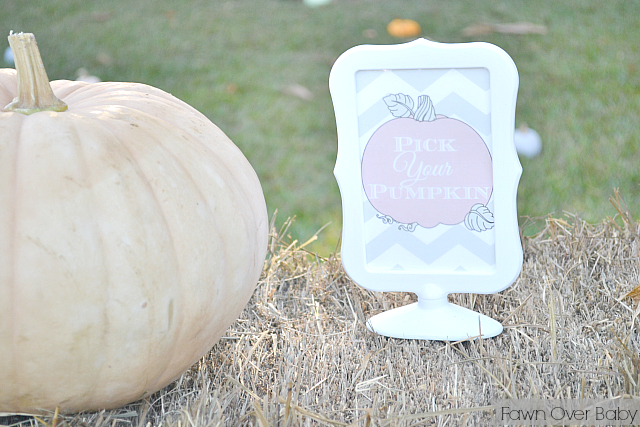 I wanted to keep the festivity close to home and transformed our backyard into a peach and grey themed pumpkin/harvest paradise complete with a pumpkin patch, photo booth and a harvest breakfast feast! 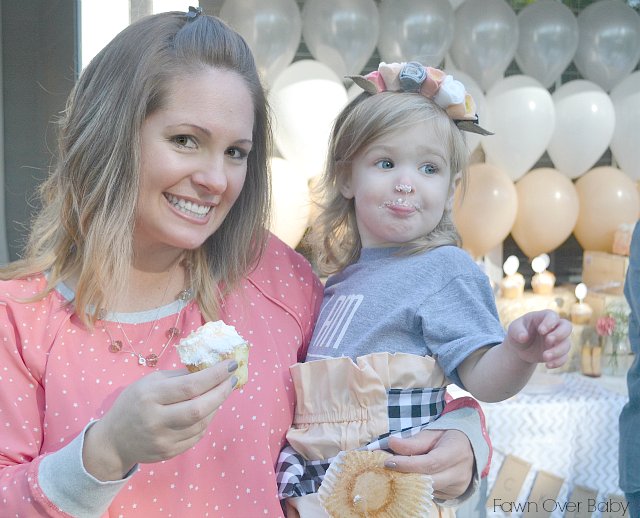 There's kind of a lot to take in (I told you, I had to make up for last year -don't judge too harshly, wink wink) so feel free to follow along as I take you on a little tour of McKenzie's Backyard Birthday Soiree! Two weeks prior, each guest received a custom designed invite by the talented Kayla, owner and creator of Etsy Shop, Lilly and Wes! Kayla was so wonderful to work with! 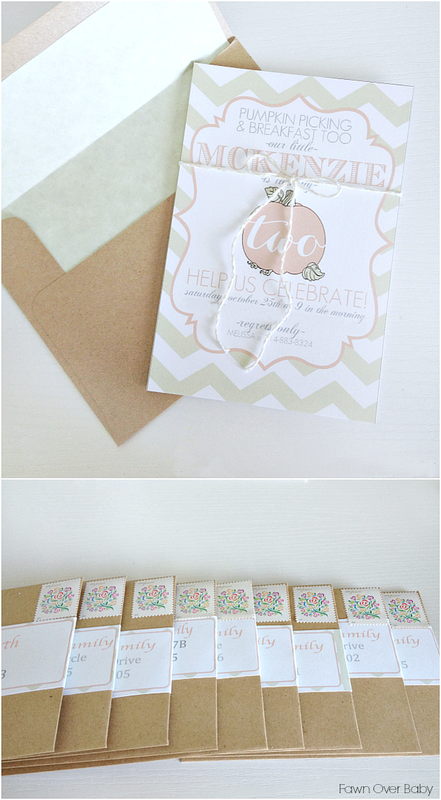 After sending her the list of colors that I had in mind and theme we were going for, she quickly came up with this sweet invitation along with a matching set of party printables. 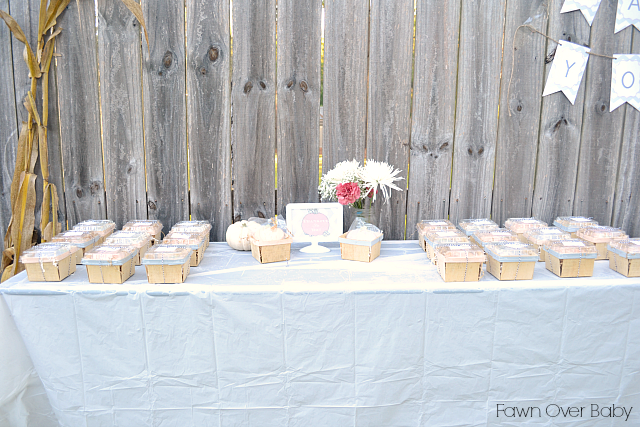 The set included everything from cupcake toppers and bottle wrappers to these adorable wrap-around address labels! 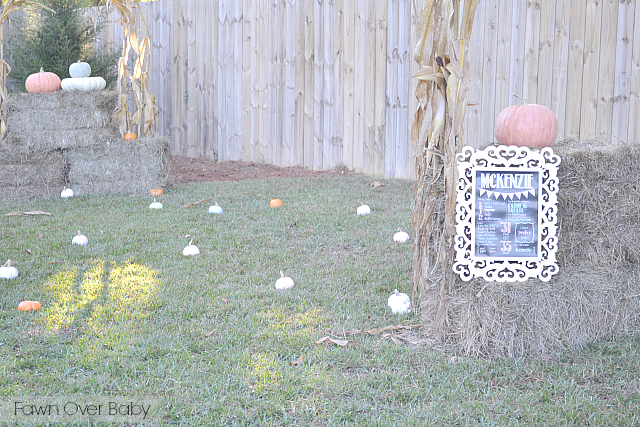 Most of the party decor, I found during last year's clearance stock at Michaels and Hobby Lobby. A lot of these things have been in storage(our attic) since then and it felt like it was MY birthday as I began to unpack it all and see everything that I had forgotten I bought. 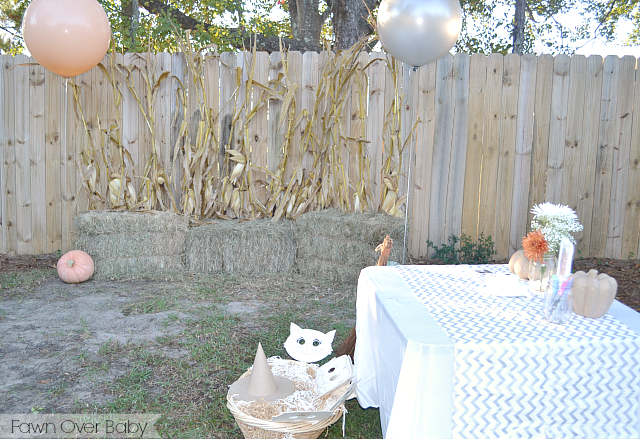 We (more like I) decided to go with a more subtle color palette of pastel peaches and grays for our harvest pumpkin patch party. 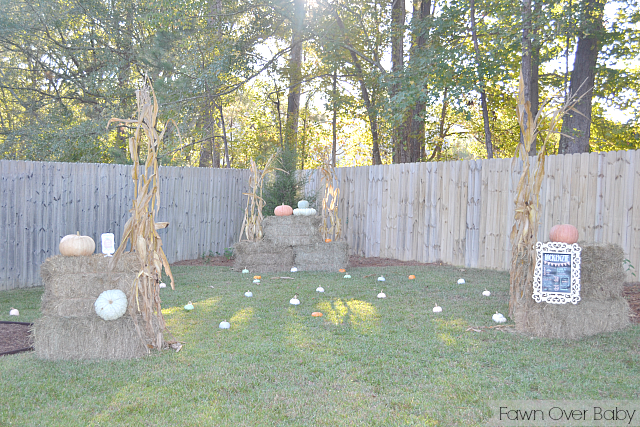 Although I love the bright oranges, reds and browns that represent autumn, I wanted to create a softer tone to offset our backyard outdoor setting. 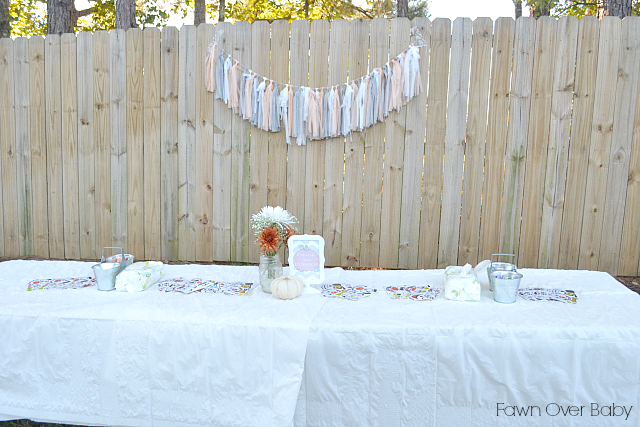 I went with an ombre balloon backdrop as it added the perfect touch of whimsy and coordinated so well with the rest of the party accents. Not to mention, it was extremely affordable. 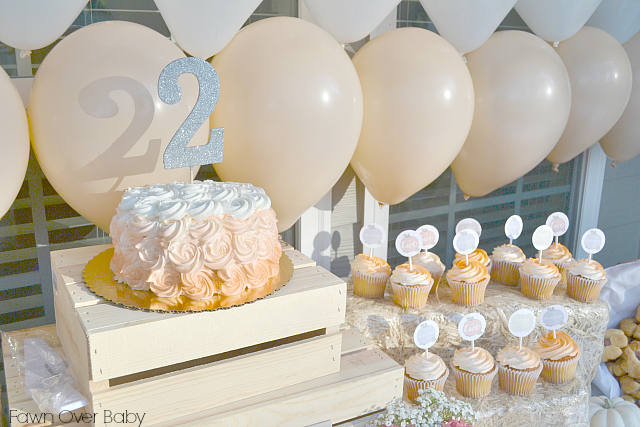 Pastel colored balloons are tough to find at brick and mortar, so of course I turned to Etsy and found these affordably priced at, Sweet Creations! 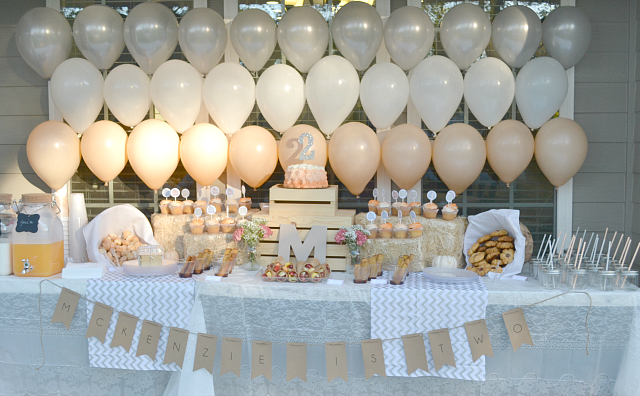 The adorable craft paper banner that spells out "McKenzie Is Two!" is from amazing stationary shop, Magnolia Lettering!! 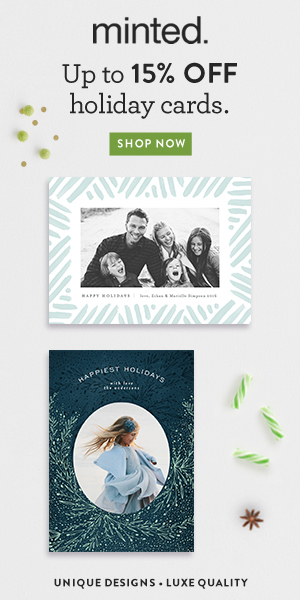 If you are in need of simply chic and unique stationary, Rachel is so great to work with and so talented! Since party time was early, 9:00am to 10:30am. Breakfast was what was on the menu! 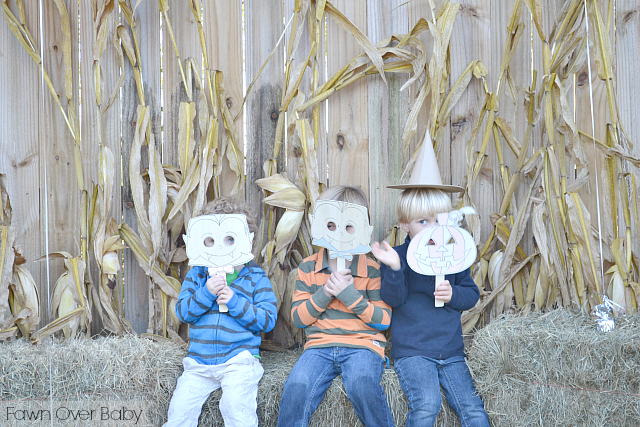 I have to say, even though it was an earlier time frame, I actually think it was perfect for all the littles' schedule. It provided a wonderful morning play for the kids and by the time party was over - it's lunch then off to nap. 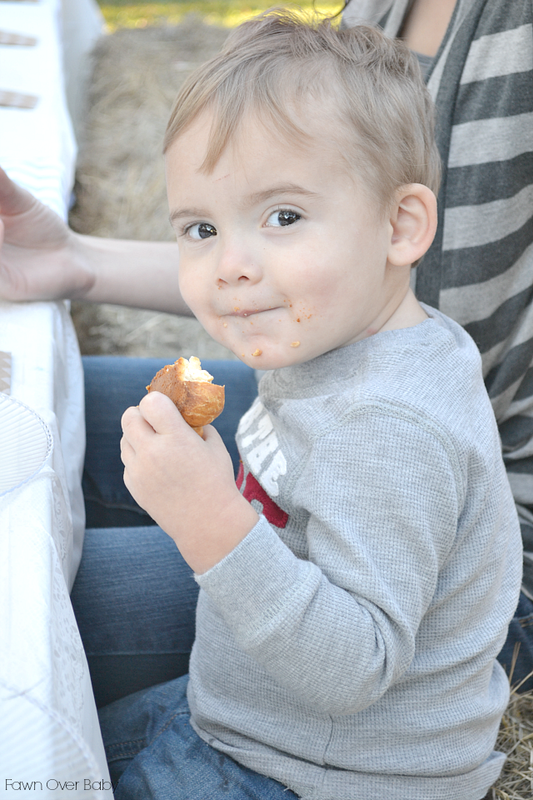 So we were able to avoid the "tired, cranky and hungry" fit that usually accompanies a middle of the day celebration. It also freed up the rest of our and our guests' day to relax and/or make additional plans. 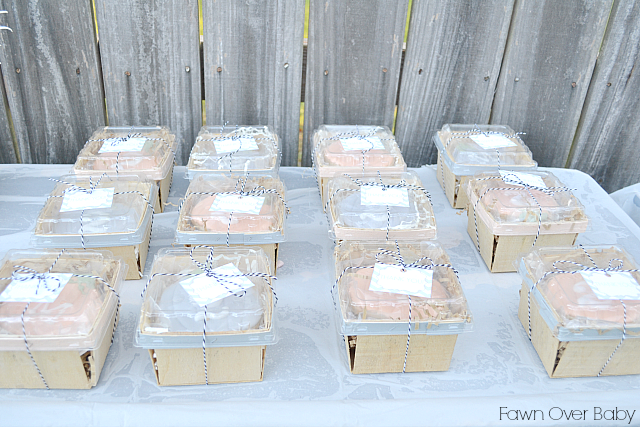 For our breakfast food assortment, I tried to keep each dish kid-friendly and easy to carry around. I found this adorable fruit-in-a-cone assembly resembling "horns of plenty" and thought they would be such a sweet touch to our harvest themed breakfast. I purchased the cake and cupcakes from my local Publix Grocery Store. 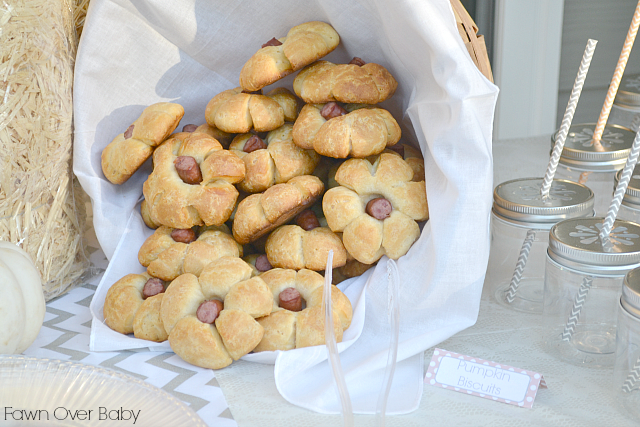 They were so yummy and the exact replica of the Pinterest photo I brought in. 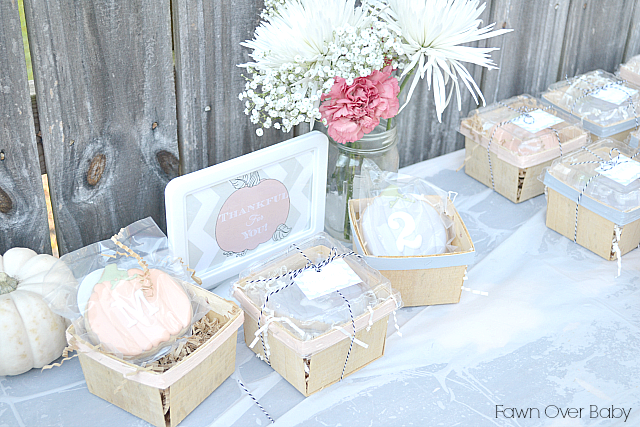 The rosettes were an ombre color pattern of peach to white!! 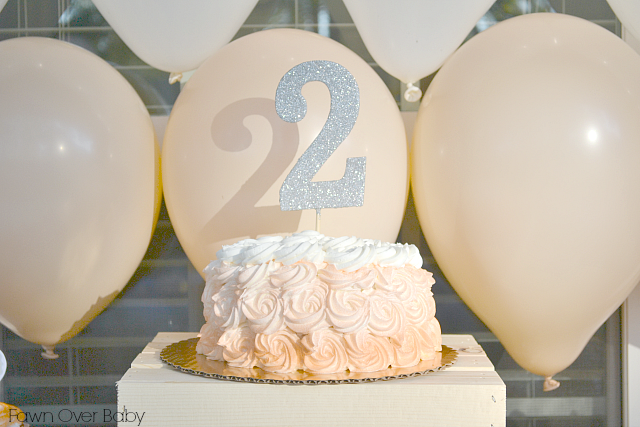 The Sparkly Silver cake topper was purchased at Hobby Lobby in their party section and the Craft Letter "M", I found on the clearance aisle at Michaels. 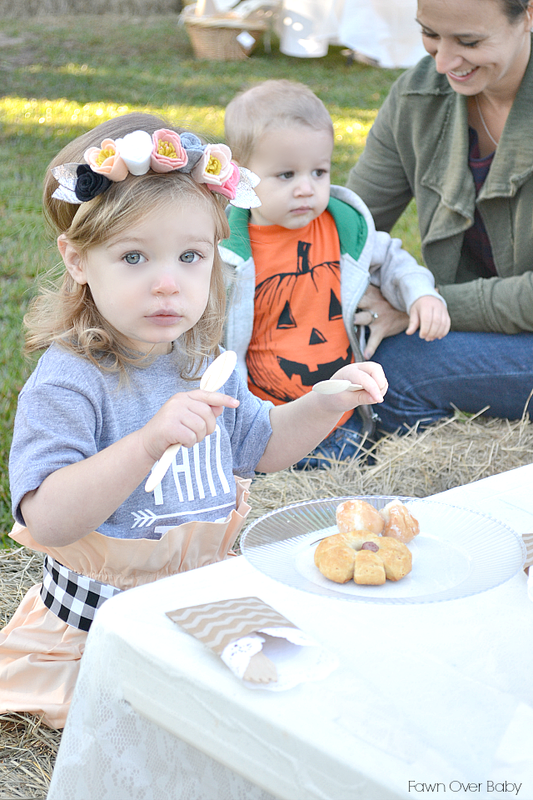 We also served french toast sticks and pigs-in-a-blanket in the shape of pumpkins (how-to here). 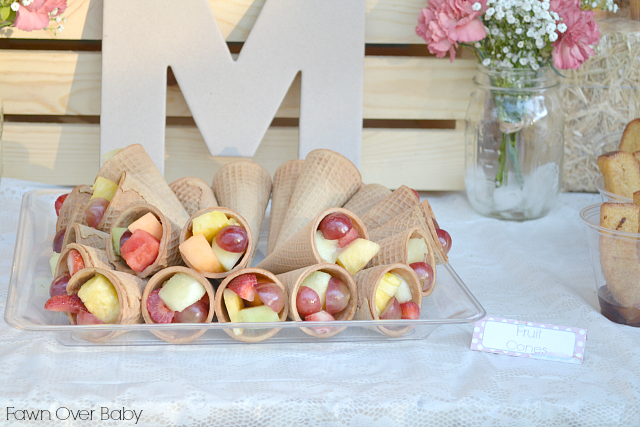 The kids loved these and they definitely helped to get their tummies nice and full. 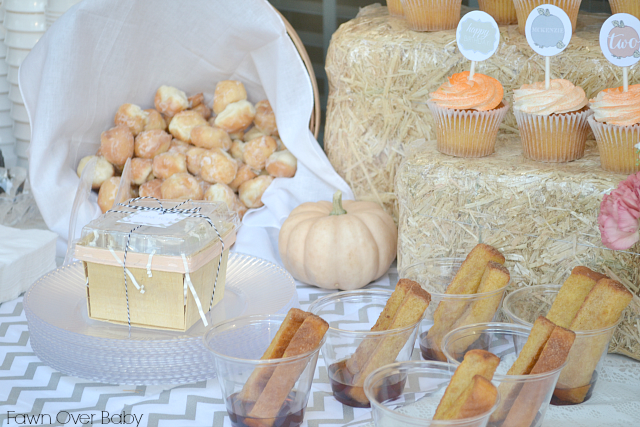 Along with French Toast Sticks, Cupcakes and Cake, we served donut holes. I know parents were beyond thrilled to see this much sugar so early in the morning! (sarcasm). 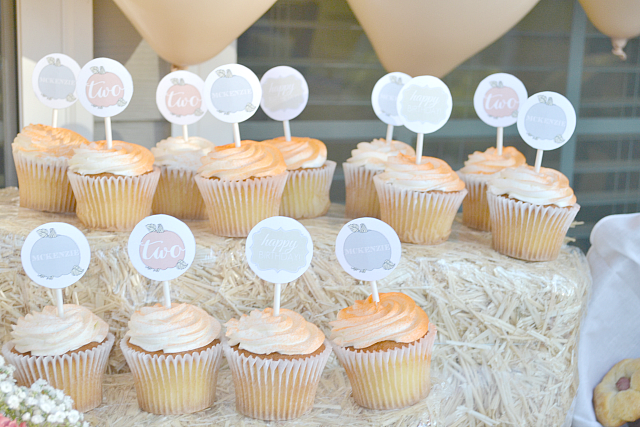 As mentioned above, these adorable cupcake toppers were designed by the wonderful Kayla from Etsy Shop, Lily and Wes! She was so great to work with and quick too!! 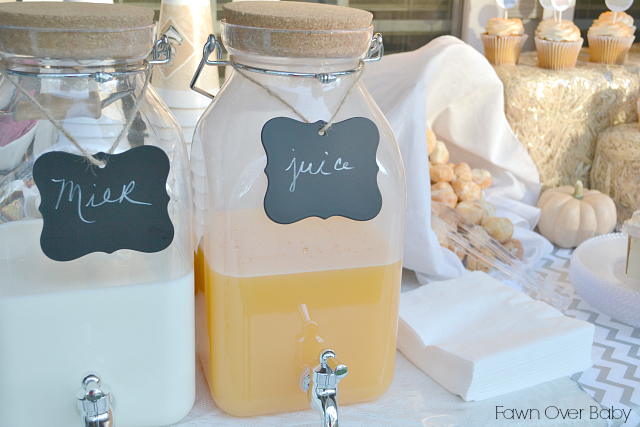 I'm so in love with these fun drink dispensers? They were a purchase from Walmart and the cute little chalkboard tags were included. The best part about them, they are plastic!!! I know, please don't hate me all of my "say no to plastic" mamas. It was so nice not having to worry about the possibility of broken glass everywhere. Please forgive me. 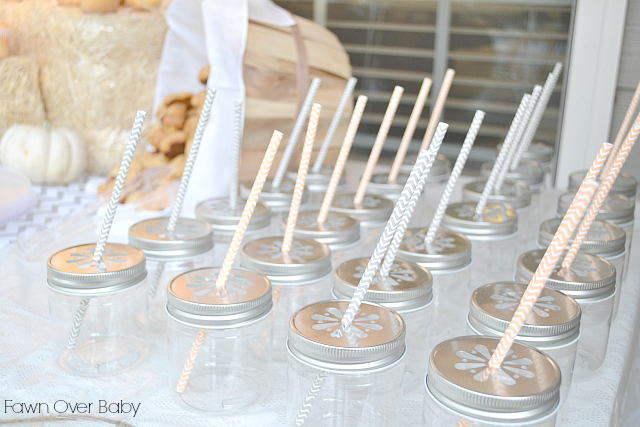 We served drinks in these fantastic plastic mason jar sippers (again don't hate me, they're plastic). 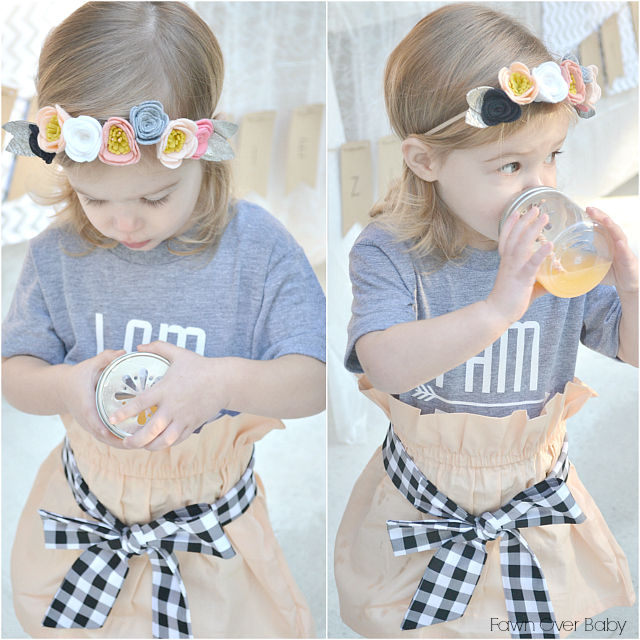 I purchased them from etsy shop, Dime Store Buddy and came with the sweet little flower lids too. 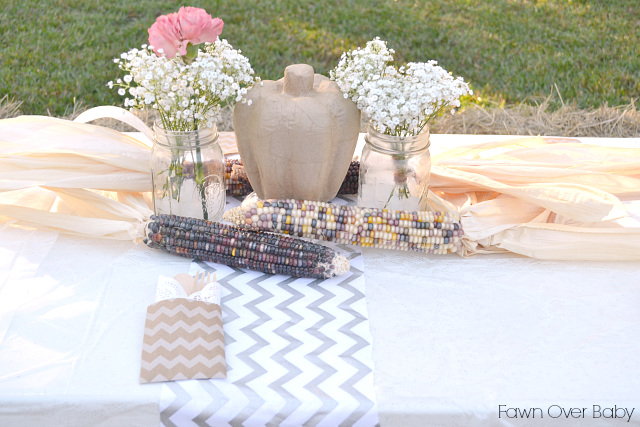 The gray and peach chevron paper straws were purchased at hobby lobby. 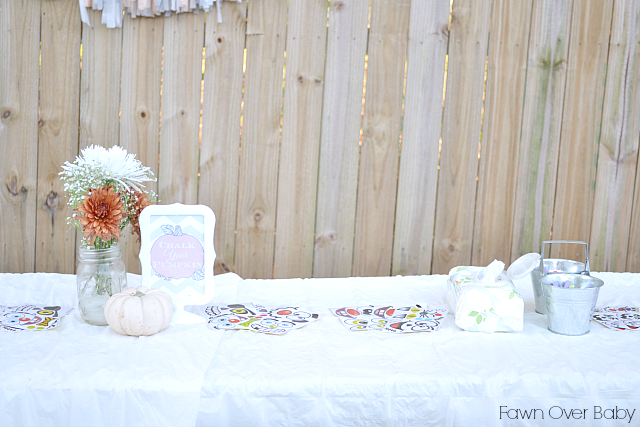 More fun party printables from Lilly and Wes! 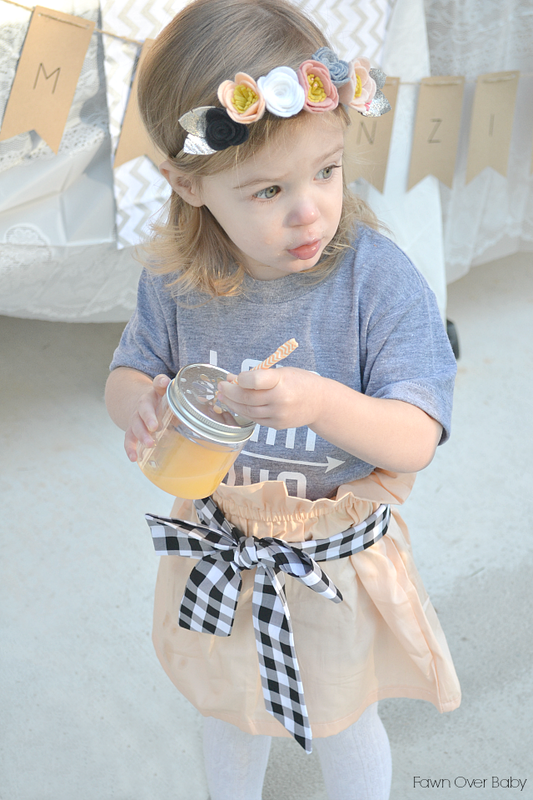 Kenzie Birthday Outfit was the perfect color combo to match her party! 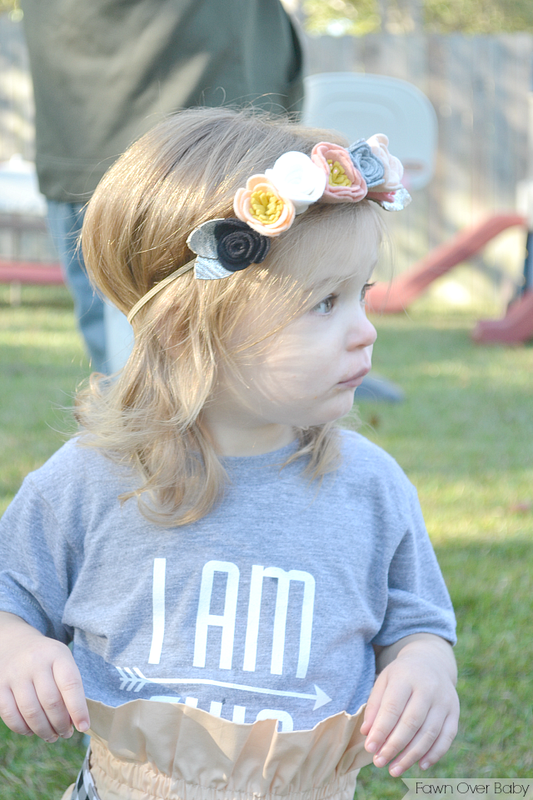 Although you can't see the entire saying on her printed tee (It says "I AM TWO") from Hatcher's Press, it was the perfect touch of comfort to her swanky birthday party attire. 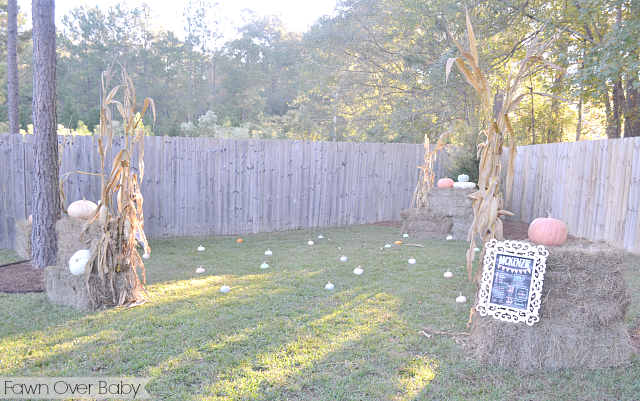 At first, I thought about just letting the kiddos eat while they play. 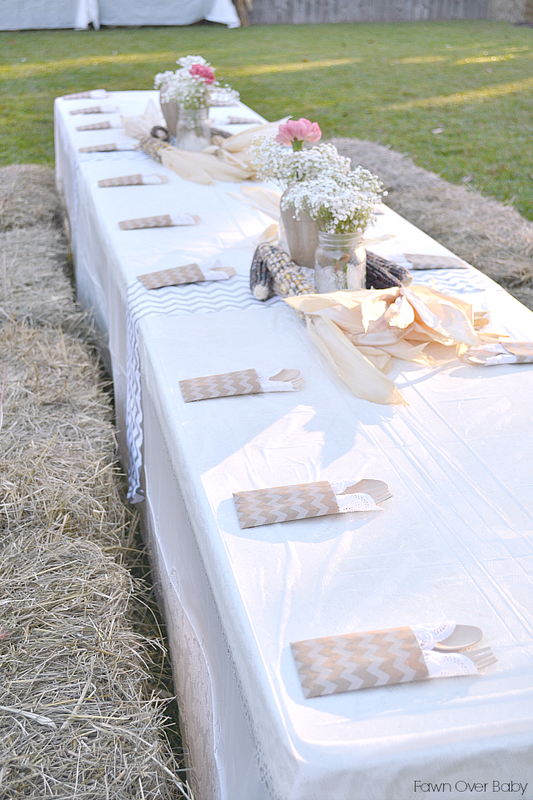 Then found an adorable idea on pinterest to set up a "harvest" style dining for kids using bales of hay as seating! 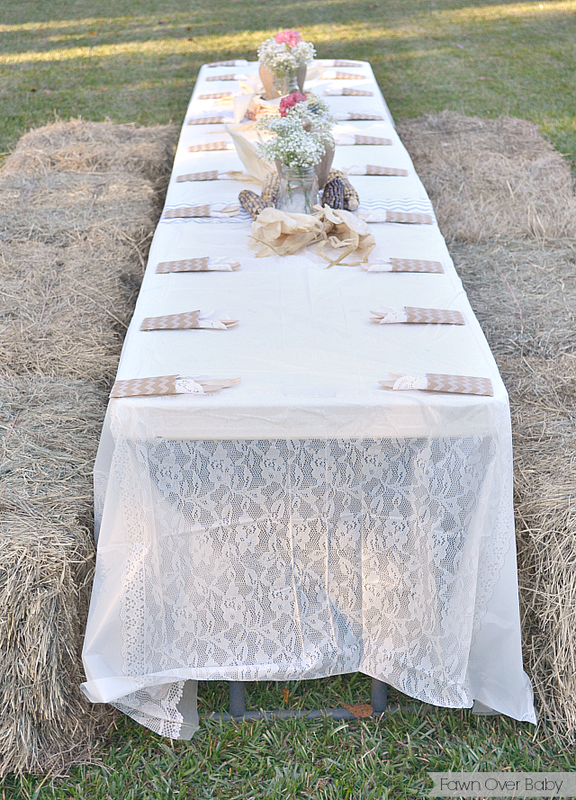 It was too perfect for our theme to leave out, so last minute I incorporated this fun little harvest table as a place for guests to sit and eat so they didn't have their hands full. 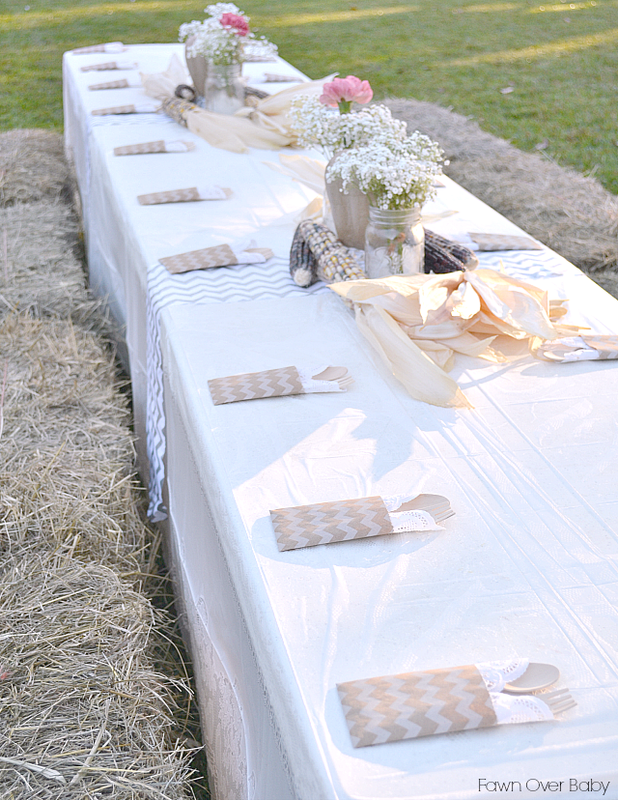 I was so lucky to find our bales of hay for rent at our local farmer's market! Yes, rent!! I had no idea you could do such thing. Furthermore, I have no idea what I would've done with all these bales if I had bought them. 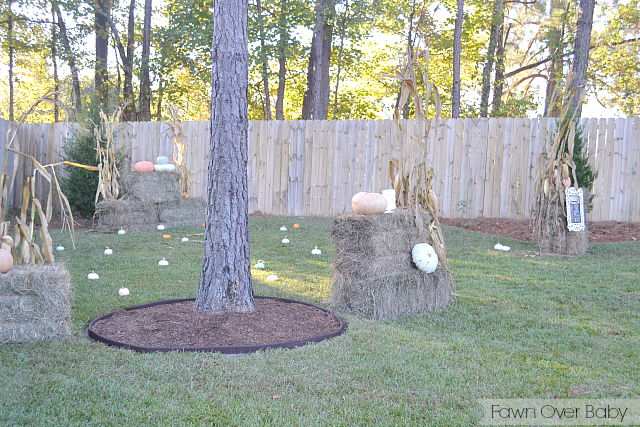 Thank goodness I was able to give them back afterwards, as I'm sure our backyard would've eventually turned into one big hay field. 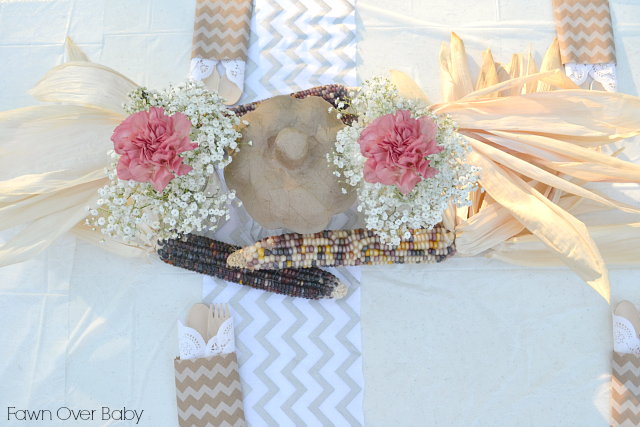 I wanted to dress the table up a bit, so of course I had to add a few centerpieces. 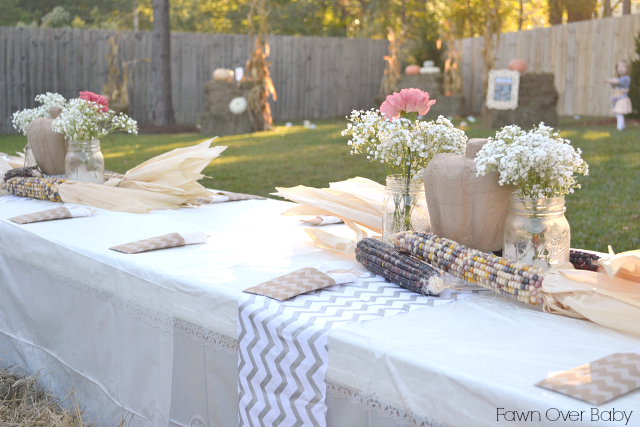 I used plastic lace printed table cloths from the $1 store and layered three gray chevron fabric strips as vertical table runners. 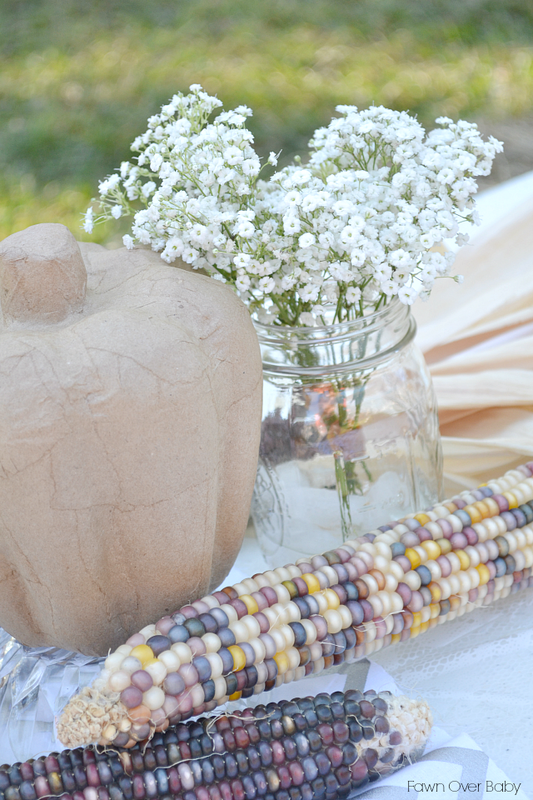 I added dried corn husks (purchased at Publix Grocery Store), paper mache pumpkins (Michaels) and a simple floral arrangement in mason jars. 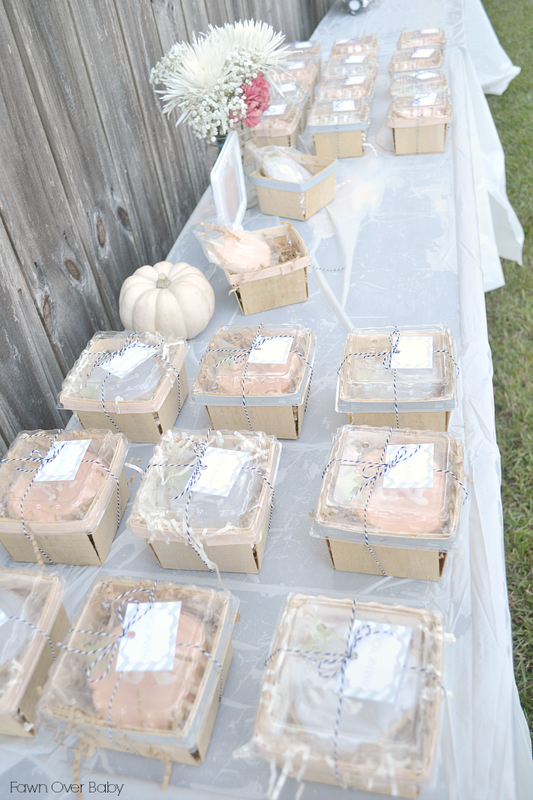 My favorite table accessory was the adorably packaged wooden utensils from Etsy Shop, Wrap & Revel!! 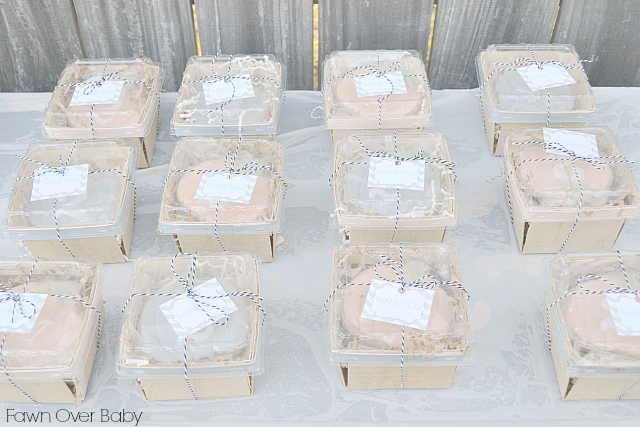 They came with a sweet lace doily bundled in a chevron patterned craft paper sack. Their little shop is filled to the brim with party accessory supplies and packaging that are so on trend and perfect for every occasion!! 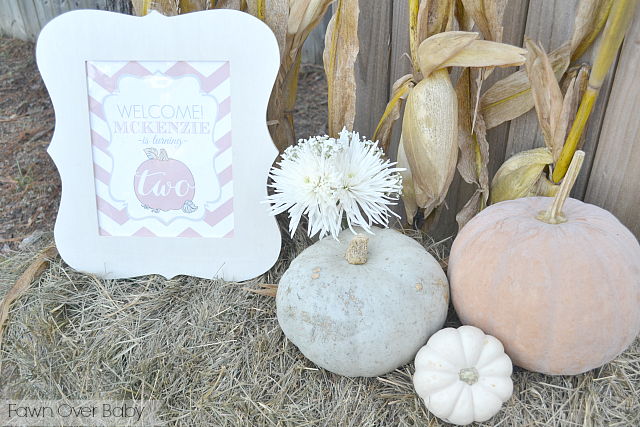 We had a sign on our front porch directing all of our guests to the back where they were met with this sweet little Welcome Sign from Etsy Shop, Lilly and Wes. 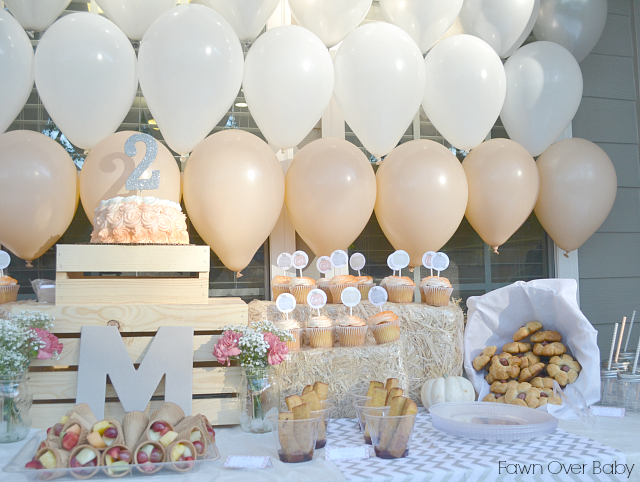 Another part of our wonderful party printable package. 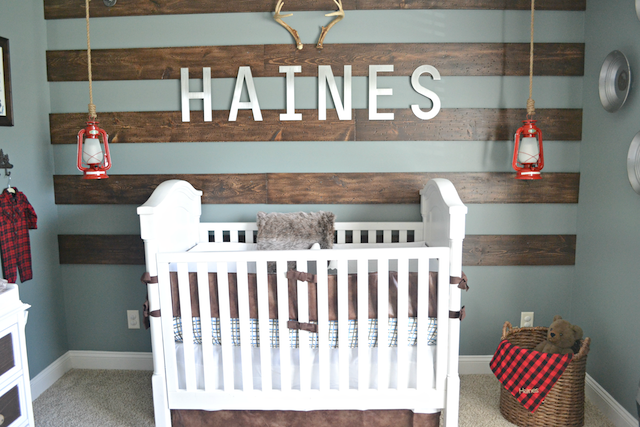 The wood frame was purchased at Michaels in their wood working section. 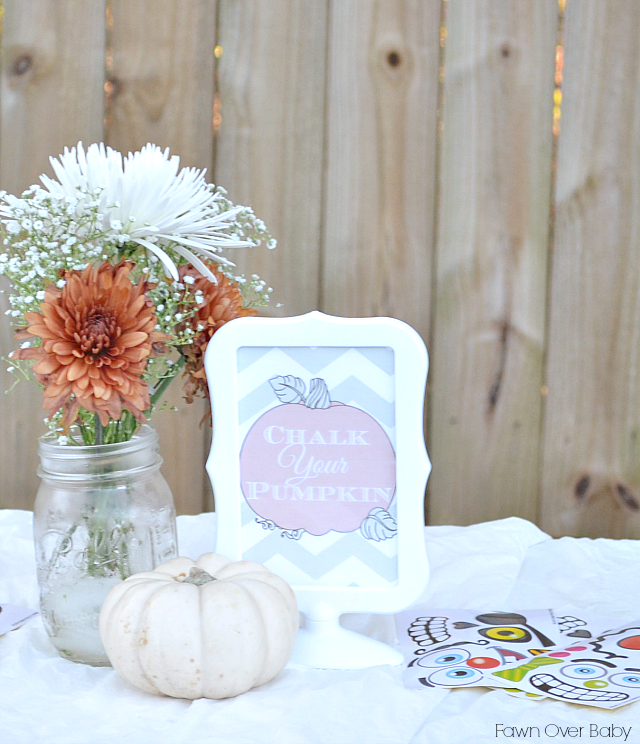 Since I was unable to find mini size pumpkins in pastel "heirloom" colors, I decided to paint them to match the overall color scheme of Kenzie's party and added chalkboard paint finish for the "chalk decorating station." 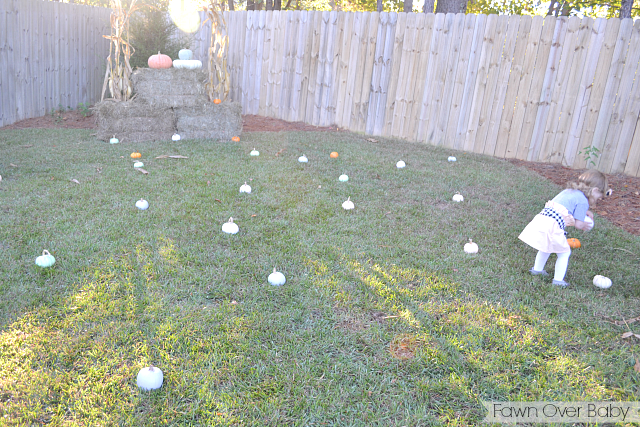 Our pumpkin patch was set up more like an 'easter egg hunt', as I spread out mini pumpkins all over creating a fun little area for little guests to pick their preferred color. 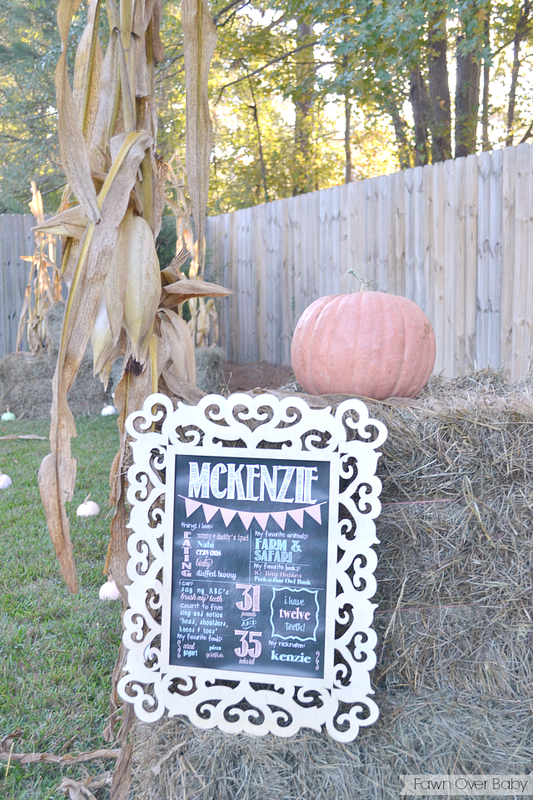 I really wanted to incorporate a fun little chalkboard sign for Mckenzie, however, I'm not the best at chalkboard art. So I was excited to stumble upon the. 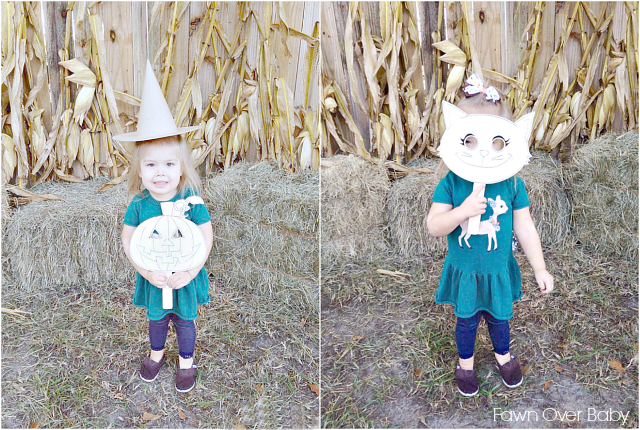 wonderful shop Ashley's Craft Therapy on Groop Dealz and scored one of her adorable Birthday Poster Print at a steal! 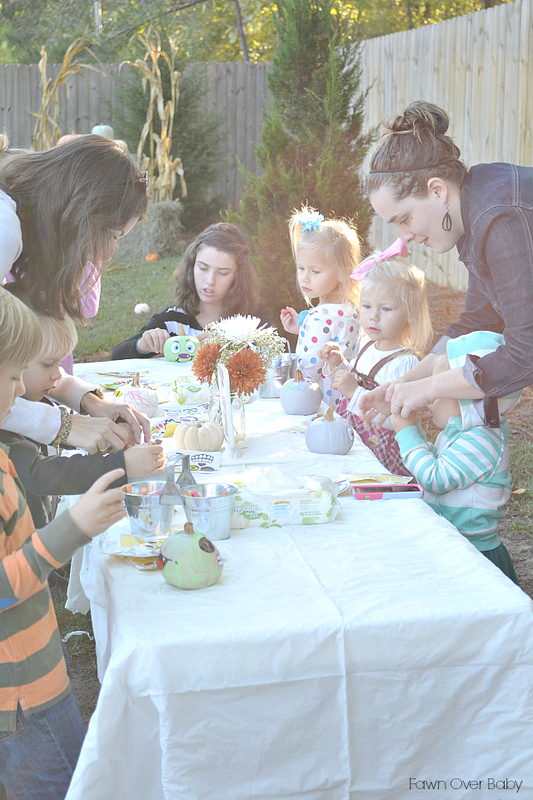 Our decorating table was such a great activity for the kids. 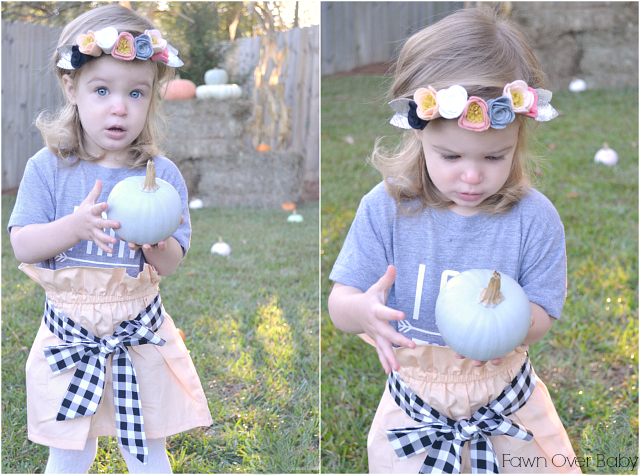 After picking their chalkboard painted mini pumpkins, they were able to decorate them with chalk and stickers that I found on Amazon. It was a lot less messier than paint or markers. I had wipes ready to go though for the chalk dust explosion that I'm sure erupted after they were done (still an easier clean-up then paint). I know photo booths are so over done, however, I can't help but enjoy them whenever we attend a party or wedding and the photos are so fun to look back on. 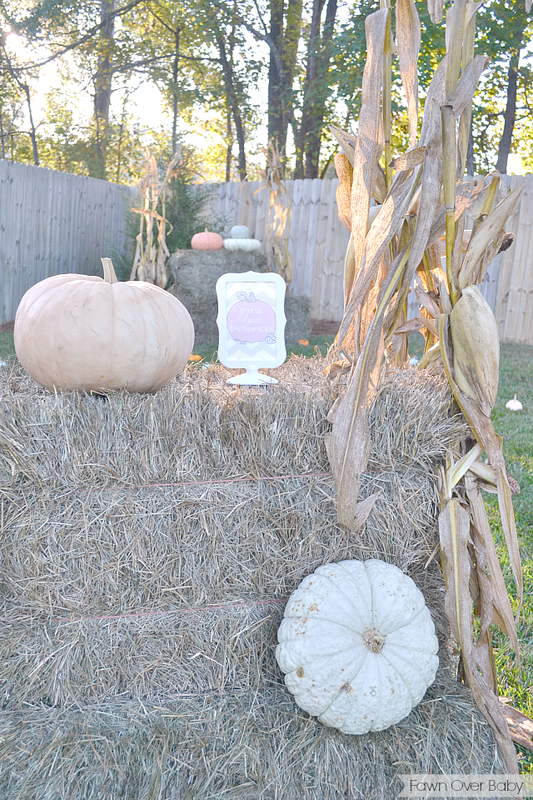 So I had to set up a little photo booth for guest to capture their fun goofy side! 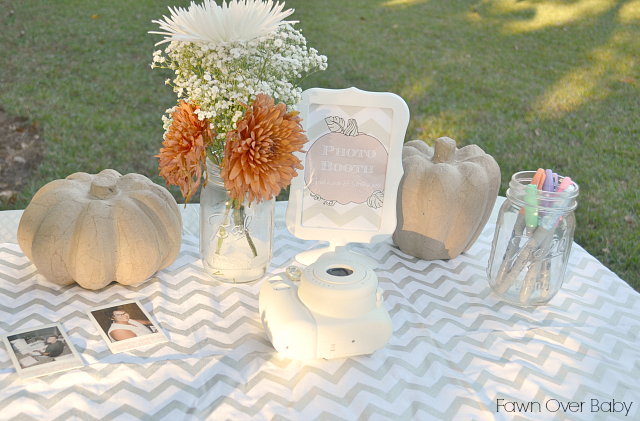 I sat out a cute polaroid camera ready to snap photos, so guests could take them home same day. I bought this one off of Amazon at a great price (at the time). It was so much fun to play with and definitely reminded me of the good old days when these were used for every party in our household growing up. 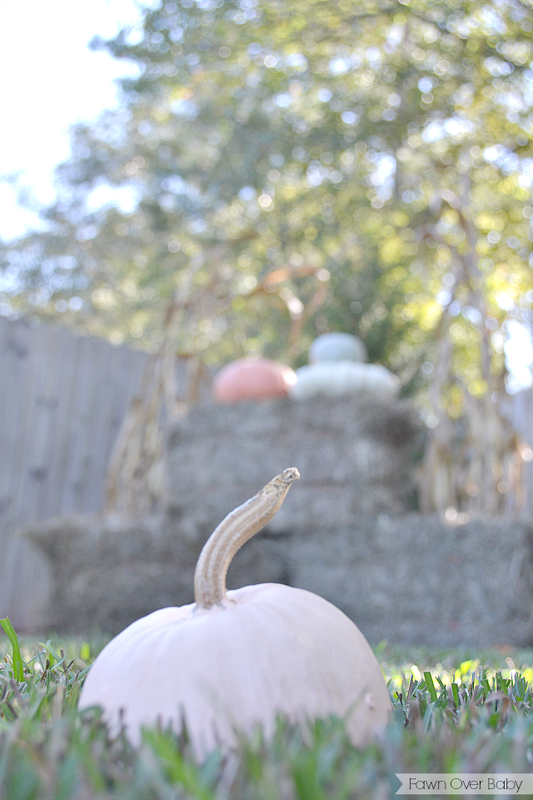 I also had props set up for guests to use for their photo opp. 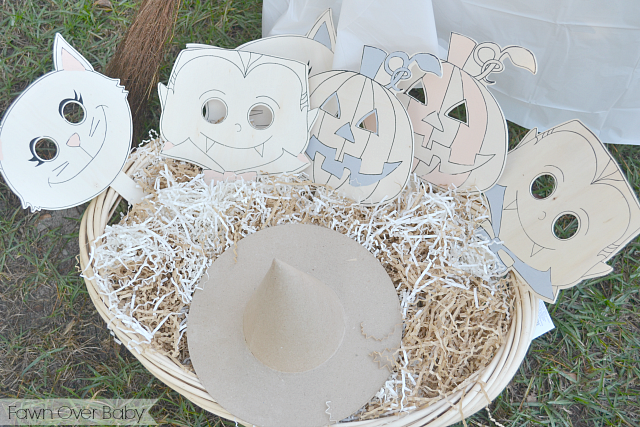 Our basket of prop goodies included wooden masks I bought at Michaels on clearance (.99each) and accented them with peach and gray paint. 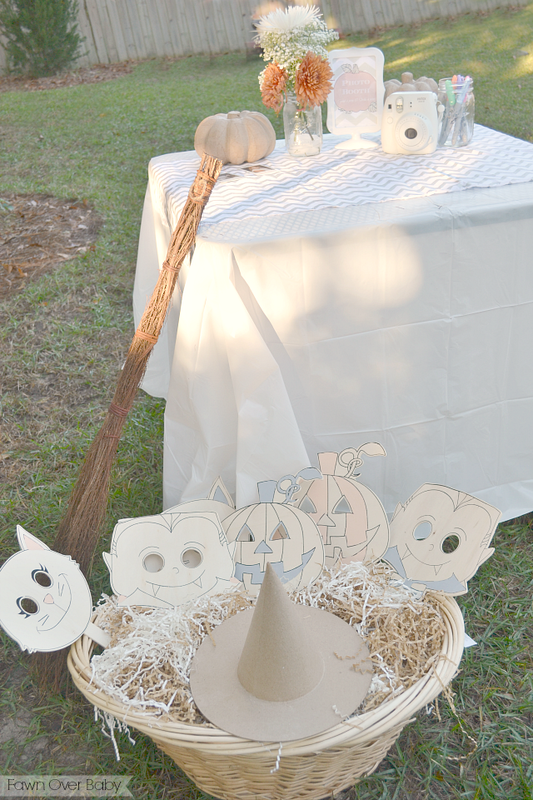 The paper-mache witches hat and cinnamon broom stick were purchased from Michaels as well. 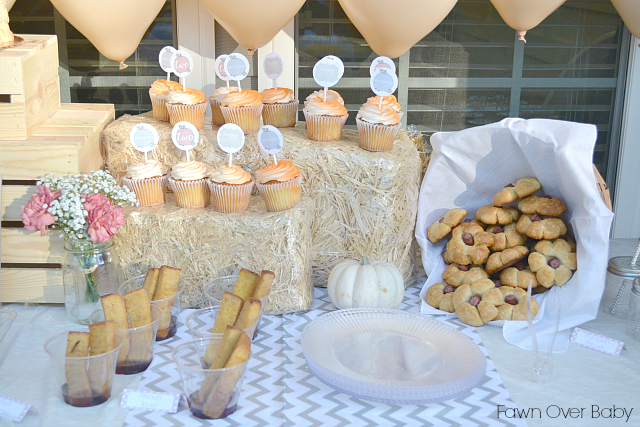 Our delectable party favors were custom pumpkin shaped cookies from The Baked Equation! Can I just say that these cookies were a work of art!! Melissa, artist, baker and owner of The Baked Equation was an absolute JOY to work with. 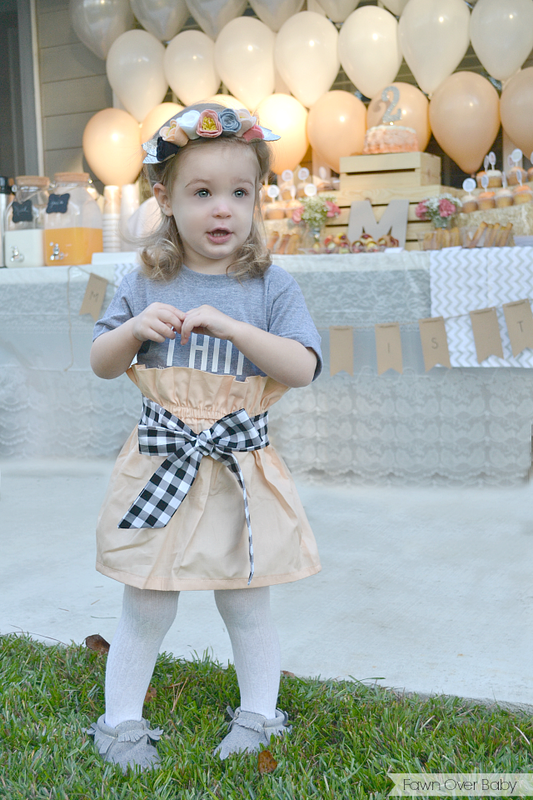 I simply sent her our invitations and she came up with the perfect combo of peach and gray frosted cookies that matched to perfection. 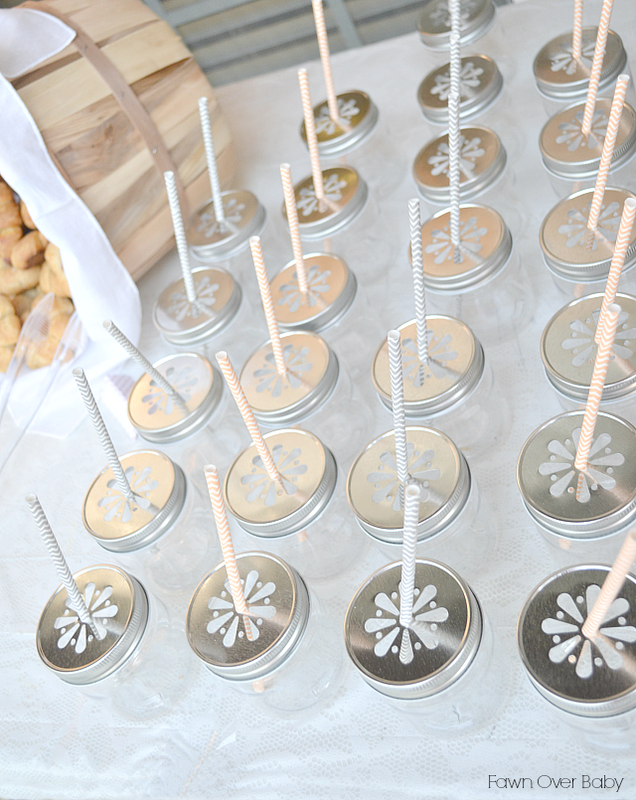 If you are in need of a unique and yummy treat for an upcoming event or gathering, The Baked Equation provides the best customer service, pricing and product that will add the perfect unique personalized touch! 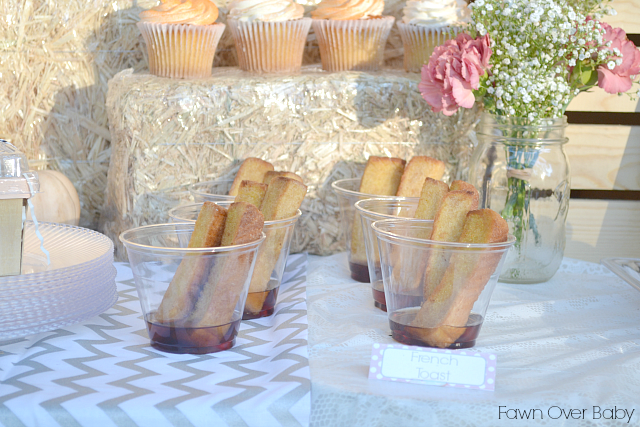 The cookies came out so beautiful, I decided to display them in these natural wooden berry baskets I purchase from Etsy Shop, Pink Lemonade Party (lids included). 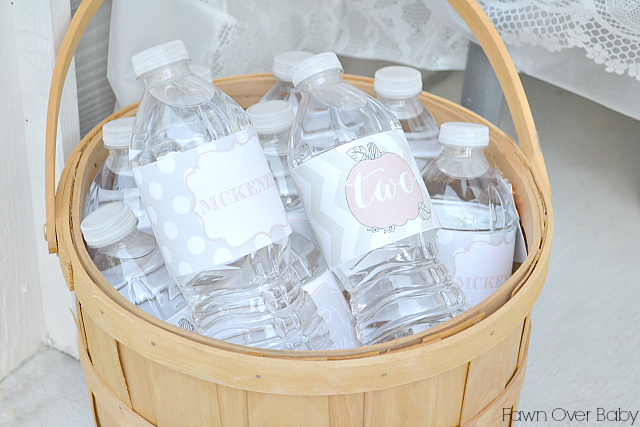 Another great party supply shop from Etsy that is filled with adorable party accessories perfect for any type of occasion. I'm so proud and thankful for our beautiful little blessing Mckenzie and I couldn't be more excited to have another year of being a mom under my belt! She has made our lives so rich and full of love, I'm so blessed that God chose me to be her mommy. 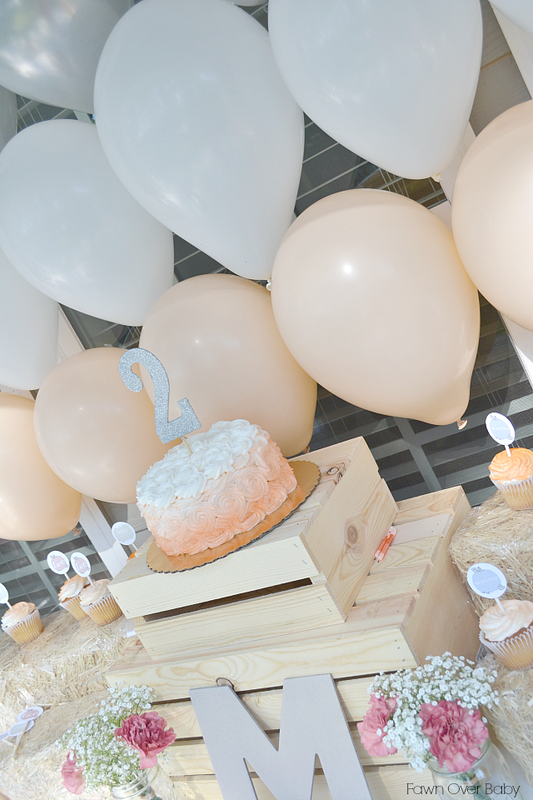 "Happy 2nd Birthday Baby Girl!" Love this. Amazing job!!!! Must have taken a lot of planning to get all of this done. 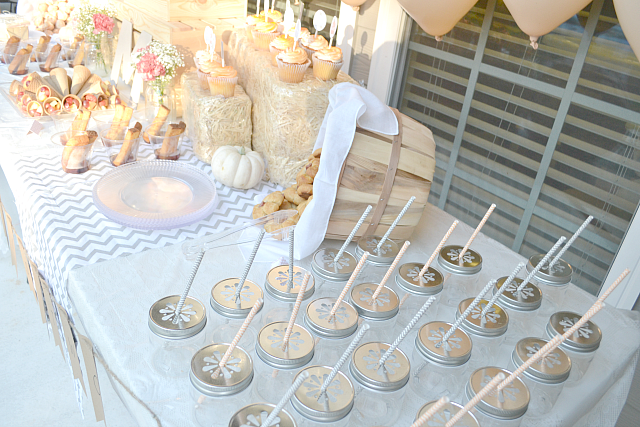 This turned out to be such a cute party!!! McKenzie looked like she had a blast, which is what it's all about! Can we talk about how cute the cookies are?! You did an amazing job putting it all together! Wow! That is so gorgeous!! 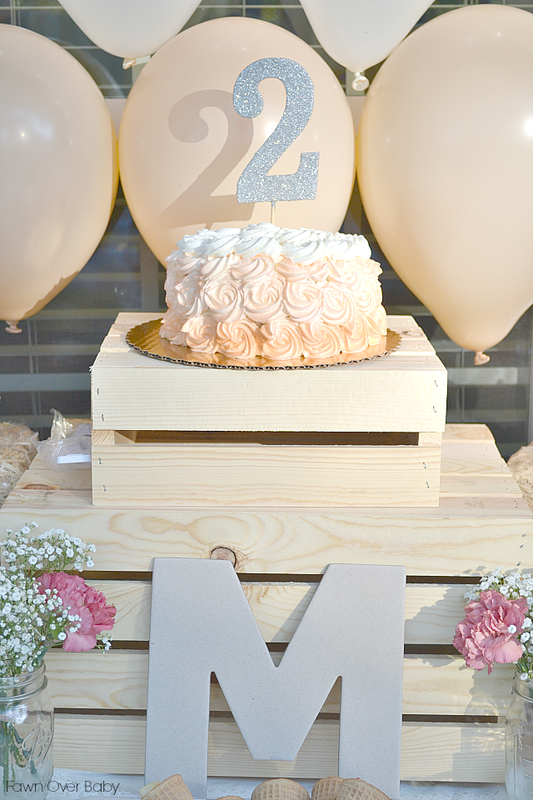 The cake was beautiful! 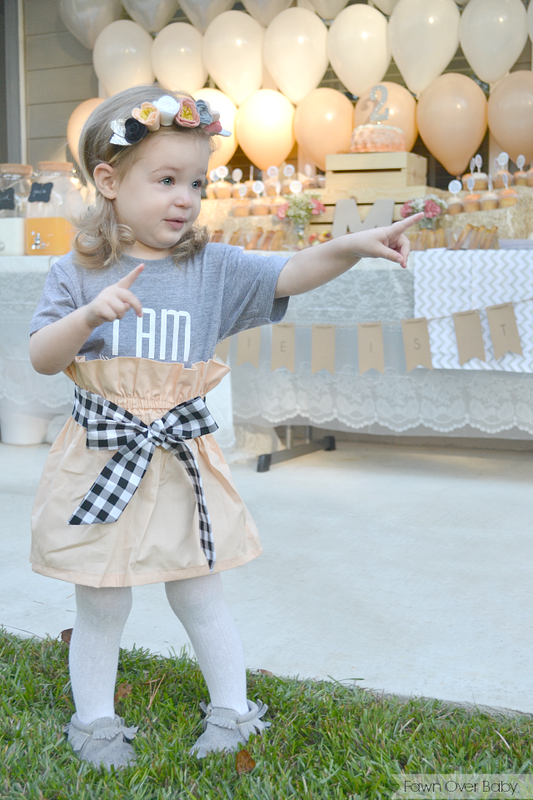 My baby girl turns two in 6 months and I can't believe how fast time is flying! Such a cute family you have! OMG!!! 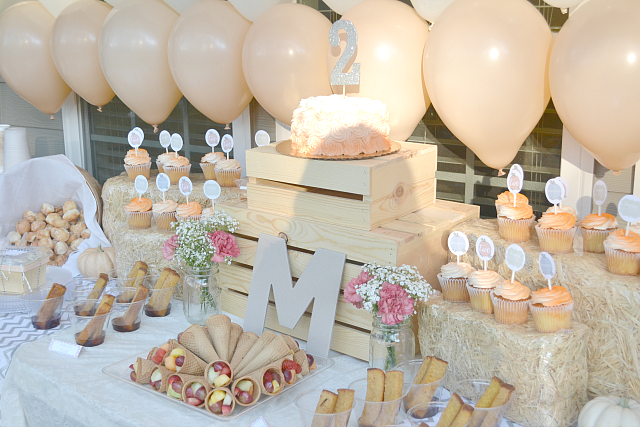 I love this birthday party… How adorable.. Wish it was my birthday!! My little ones turns 1 in a week and I am so excited about her birthday!! I know right??? 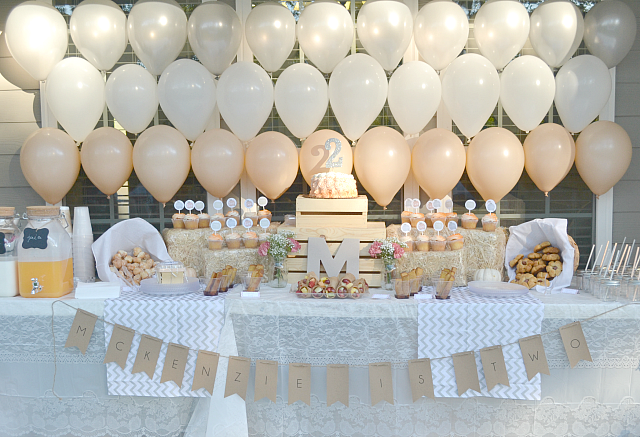 Why can't our birthday parties be this detailed? Happy Birthday to your little!! Time does fly when you're having fun doesn't it? 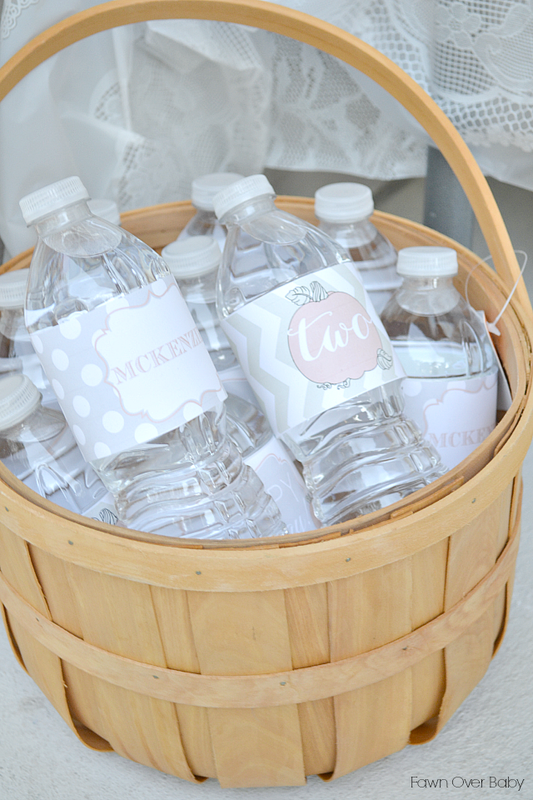 This looks like the perfect little party!!! 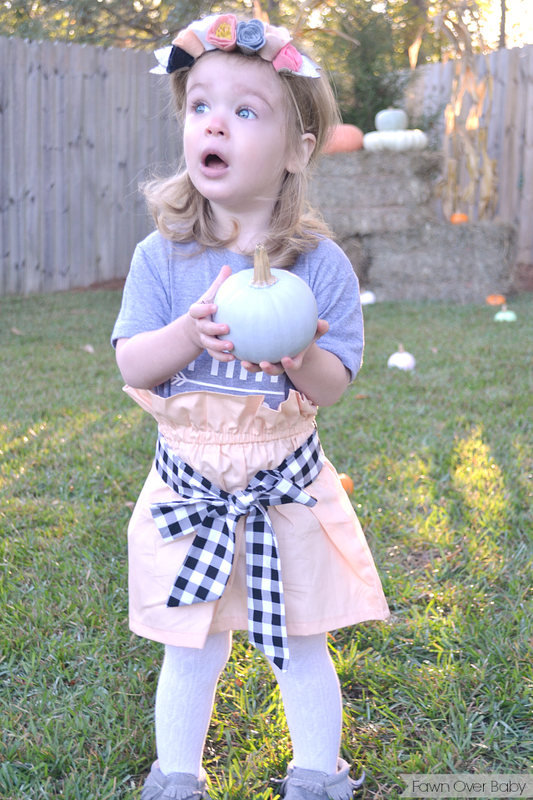 My daughter is turning 2 in January and I've not started planning anything and I am kind of starting to stress out about it!!!! I wish I could pull something like this off!!! 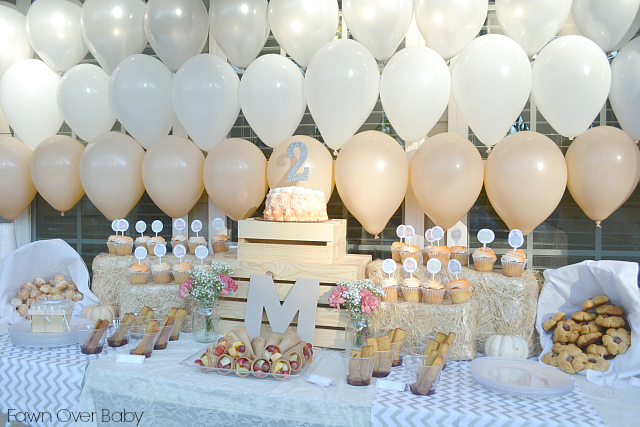 oh my WORD, such an adorable party!!! Girl, we could go into business together, lol!! :) So glad everyone had a blast! How cute! 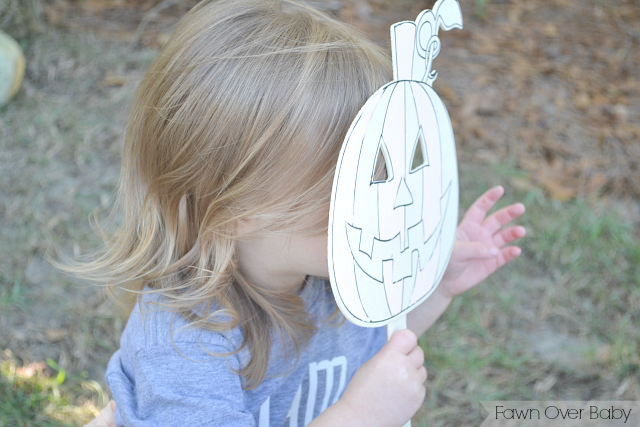 I'm doing a pumpkin patch theme for my twins 1st birthday. 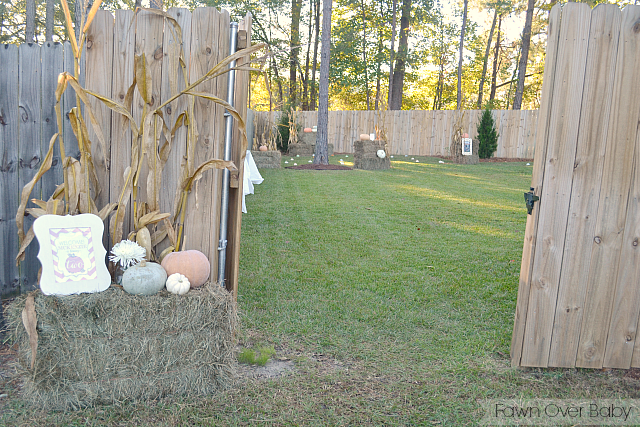 Curious, where did you find the bales and wooden crates? Hi Melissa! 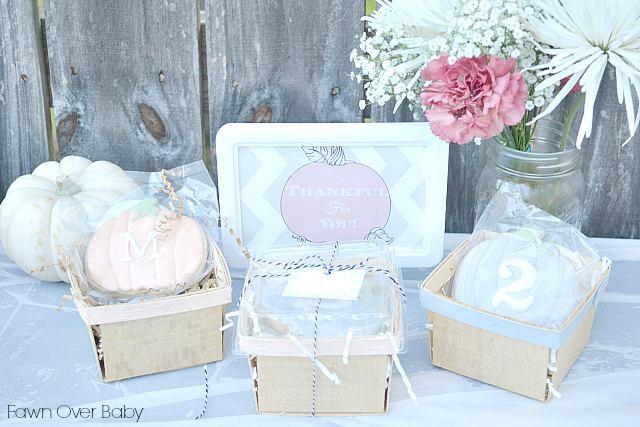 The crates are from Wal-mart (they usually go on sale around Oct/Nov). 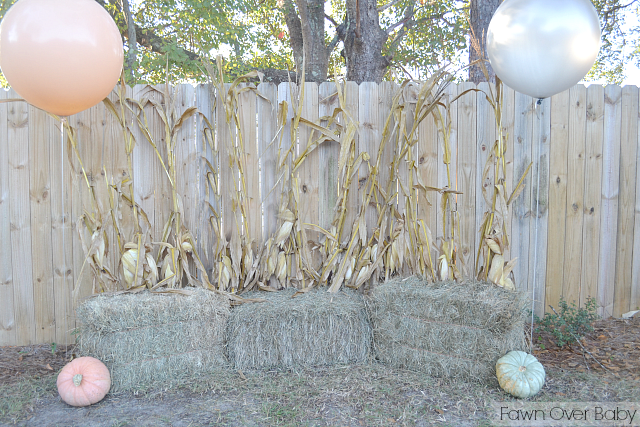 The bales, we rented from a local farmer's market. Who knew you could do such a thing. Absolutley adorable!!! 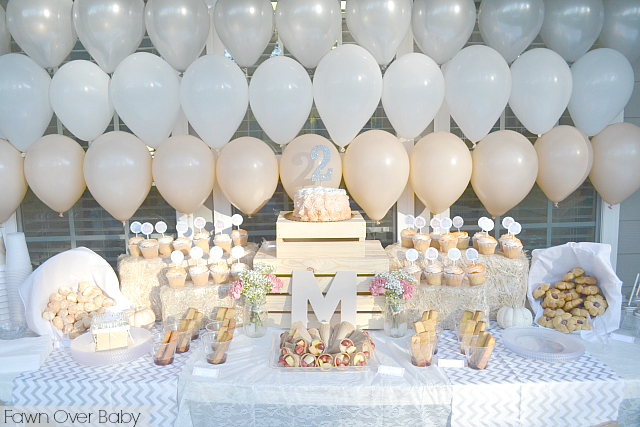 What are the actual colors of the balloons and how did you get them to stack like that? Hi, the etsy shop doesn't have the invitation you have. I love it! Did they send you the template? Our invitation was custom designed. I simply just messaged her and gave her the theme and colors I preferred and she came up with the design over night, which was so nice. I believe I just sat out the same amount of cones as guests we invited. I purchased one box of ice cream cones from the grocery store along with two large mixed fruit containers from the grocery store produce and that was more than plenty for our group. However, you may need to alter according to how big or small your party is. I hope this helps.